City Lore has developed exhibitions since our inception in 1986. Exhibits have ranged from City Play in 1989 and Welcome to Your Second Home: New York City’s Ethnic Social Clubs in 1994 at the Museum of the City of New York to Nueva York: 1613-1945 in 2010-2011 at El Museo del Barrio. 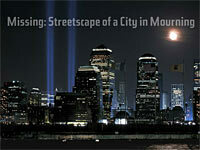 We are pleased that these two exhibits, Missing: Streetscape of a City in Mourning originally at the New York Historical Society in 2002 and Weavings of War at the Puffin Room in 2006 remain accessible in these virtual, online exhibitions. 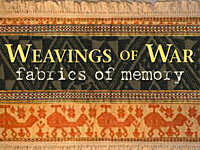 Take this virtual tour of “Weavings of War: Fabrics of Memory,” an online exhibition of contemporary textiles depicting upheavals in Central Asia, Southeast Asia, Latin America and South Africa. Over the past 50 years, traditional textile-artists in seemingly unrelated cultures around the globe have broken with tradition to record their experiences of modern warfare, exact down to the last coil of barbed wire or the shape of a machine gun. The original gallery exhibition toured seven venues across the U.S. from 2006 – 2007. Take this virtual tour of the Missing exhibit, curated by City Lore, about New York City’s heartfelt response to shrines and memorials that transformed New York City into a memorial garden after September 11th. The original exhibit ran from March 8 to July 7, 2002 at the New-York Historical Society.